In Nazi Germany, Jews’ passports are invalidated. On October 5, 1938, the Reich Ministry of the Interior invalidates all German passports held by Jews. Jews must surrender their old passports, which will become valid only after the letter “J” has been stamped on them. The government required Jews to identify themselves in ways that would permanently separate them from the rest of the German population. In an August 1938 law, authorities decreed that by January 1, 1939, Jewish men and women bearing first names of “non-Jewish” origin had to add “Israel” and “Sara,” respectively, to their given names. All German Jews were obliged to carry identity cards that indicated their heritage, and, in the autumn of 1938, all Jewish passports were stamped with an identifying red letter “J”. As Nazi leaders quickened their war preparations, antisemitic legislation in Germany and Austria paved the way for more radical persecution of Jews. 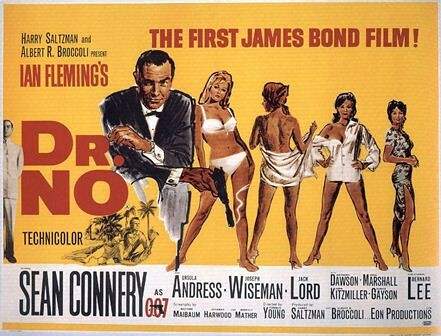 The first James Bond movie, Dr. No, is released. Dr. No is a 1962 British spy film, starring Sean Connery, with Ursula Andress and Joseph Wiseman, filmed in Jamaica and England. It is the first James Bond film. Based on the 1958 novel of the same name by Ian Fleming, it was adapted by Richard Maibaum, Johanna Harwood, and Berkely Mather and was directed by Terence Young. The film was produced by Harry Saltzman and Albert R. Broccoli, a partnership that would continue until 1975. In the film, James Bond is sent to Jamaica to investigate the disappearance of a fellow British agent. The trail leads him to the underground base of Dr. No, who is plotting to disrupt an early American space launch with a radio beam weapon. Although the first of the Bond books to be made into a film, Dr. No was not the first of Fleming’s novels, Casino Royale being the debut for the character; the film makes a few references to threads from earlier books. This film also introduced the criminal organisation SPECTRE, which would also appear in six subsequent films. Produced on a low budget, Dr. No was a financial success. While critical reaction was mixed upon release, over time the film has gained a reputation as one of the series’ best instalments. The film was the first of a successful series of 24 Bond films. Dr. No also launched a genre of “secret agent” films that flourished in the 1960s. The film also spawned a spin-off comic book and soundtrack album as part of its promotion and marketing. A six-month strike by Hollywood set decorators takes a turn as riots break out at the gates of Warner Brothers’ studios. On October 5, 1945, Hollywood Black Friday or “Bloody Friday” as what they said in the history of organized labor happened in the United States. A six-month strike by the set decorators represented by the Conference of Studio Unions has boiled over into a bloody riot at the gates of Warner Brothers’ studios in Burbank, California. The strike helped the passage of the Taft-Hartley Act in 1947 and led to the eventual breakup of the CSU and reorganization of then rival International Alliance of Theatrical Stage Employees leadership. An estimated 10,500 CSU workers went on strike and began picketing all the studios resulting in delays of several films. The City of Anaheim, California, USA is first founded. A rail crash in Ladbroke Grove, London kills 31 people. Dr. No, the first in the James Bond movie series, is released. The first episode of Monty Python’s Flying Circus is shown on the BBC. The first in the James Bond film series, Dr No, is released.